I have a favorite new kitchen toy you guys! A spiralizer. Does it make me old to be so excited about this thing? Don’t answer that. 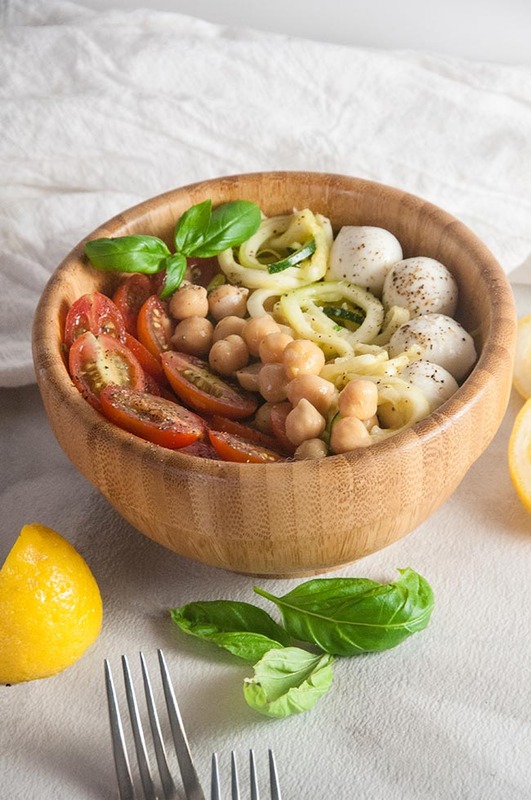 It’s how I make all things zoodles like these caprese zoodle bowls with chickpeas. I know, I know. I’m kind of late to the zoodle game. But I have good reason. 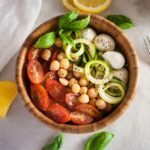 I had to find a spiralizer I loved. I have been through a few before I found this OXO Good Grips Spiralizer including a terrible electric one that did not work. But this OXO spiralizer is amazing. It’s so easy to use that literally my 2 year old daughter can use it. She loves to turn the crank on it and steals the zoodles out of the other end as I make them. She gets super excited whenever I make them because she likes to help turn the veggies into noodles. And I’m ok with her doing it. Honestly I like teaching her how to do things in the kitchen and I feel like the spiralizer is easy enough to use and perfectly safe as long as I am helping her. It’s definitely easier than chopping or grating veggies. The only downside to this particular spiralizer is that it doesn’t have the best suction to the counter so it dances a little if I’m not bracing the base. But I can spiralizer a whole zuchinni in less than a minute. It’s that easy. And just in case you are wondering, I didn’t get paid to endorse this brand or this product. I just am obsessed with my spiralizer. I love it hard. 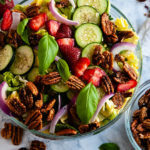 I know I told you all last week when I wrote a thousand word long word dump about random things that aren’t food related that I am trying to get healthier. Well, for me, it’s hard eating less pasta. Pasta is my go to. 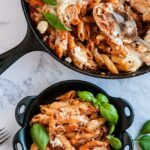 Carby, yummy pasta smothered in things like crock pot bolognese sauce. I could eat pasta literally every day. So for now, I am not giving up my yummy sauces. Nope. I’m just eating all the veggie noodles covered in yummy sauce or with yummy things added. 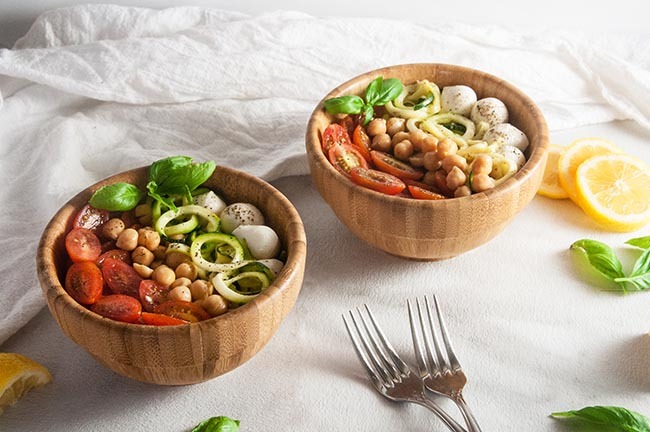 Enter these caprese zoodle bowls with chickpeas. It’s basically salad because hello giant bowl of veggies but it feels like pasta. It’s satisfying yet light. 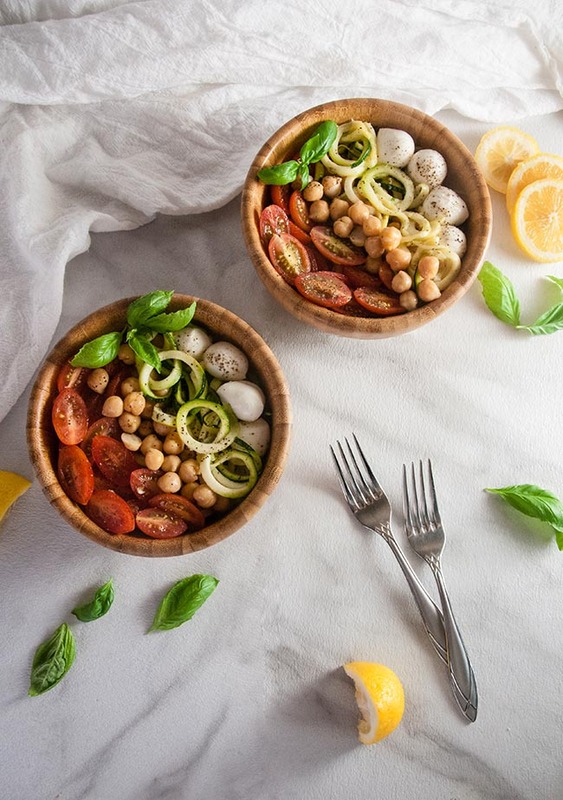 And it’s the perfect way to use up all the summer zucchini and sweet gorgeous cherry tomatoes. Plus the light lemony flavor and baby balls of mozzarella? So good. Throw some basil leaves in and it’s summer lunch or dinner perfection. I swear I am going to eat this every day for the rest of the summer to make up for that summer FOMO I told you about last week. I seem to be crushing on the lemon basil flavor. 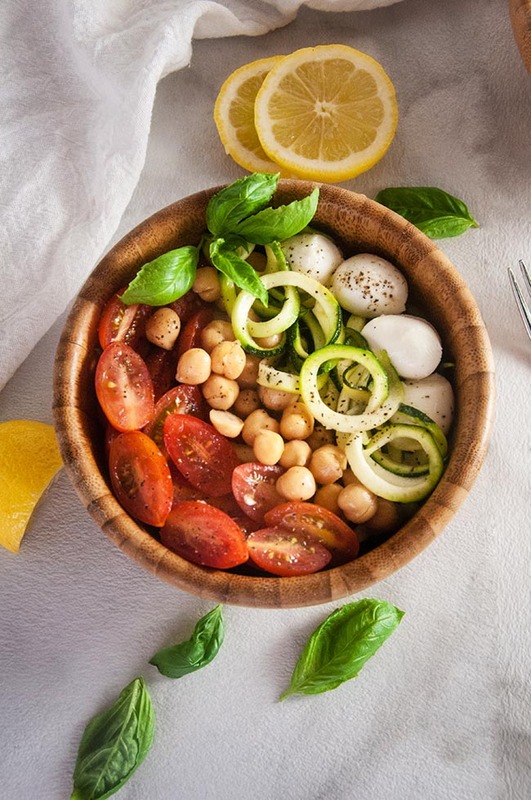 I just can’t get enough between this and the Tomato Chickpea and Quinoa Salad with Lemony Basil Vinaigrette that I’ve been eating on the regular. 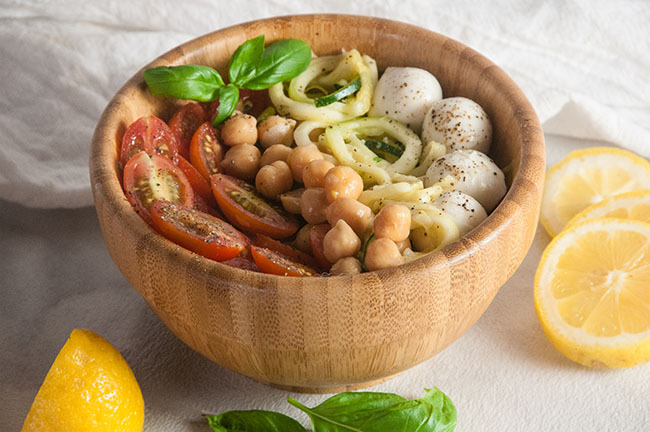 What’s your favorite way to zoodle? Spiralize the zucchini using the blade to make fettucine noodles. Sprinkle the zoodles with salt and let sit for about 10 minutes. Transfer to a paper towel and squeeze out the excess water. Heat the tablespoon of olive oil up in a pan over medium heat. Add the zoodles and garlic. 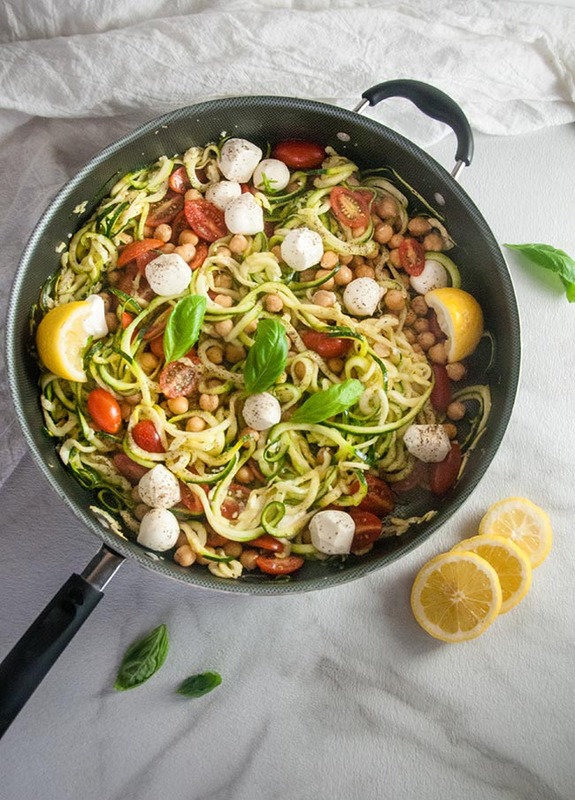 Cook for about 2 minutes until zoodles are warmed through. Add the rest of the veggies and mozzarella balls. Squeeze in lemon juice and toss with basil leaves. Enjoy! 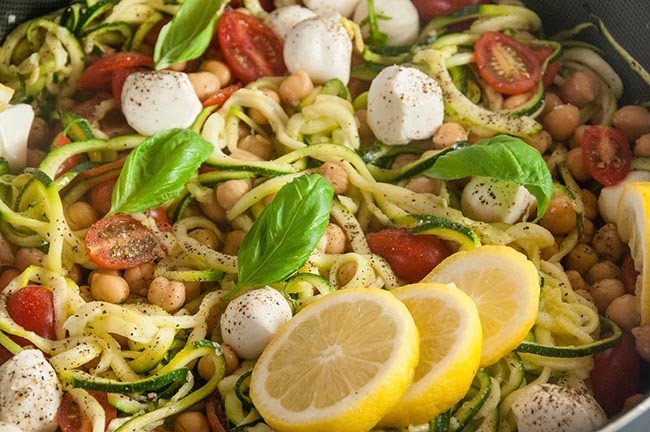 I need to get me a spiralizer, makes eating veggies so much fun and my son would definitely be a fan of the zoodles since he loves pasta and this will trick him in a healthy way. Thank you for sharing. I love love caprese and will try to turn anything into those flavors. This looks perfect! 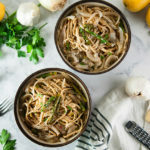 What a yummy zoodle recipe idea! Cannot wait to make this at home! I love using zoodles in dishes. 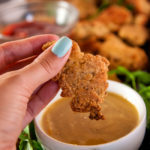 Another great recipe to add to my list.